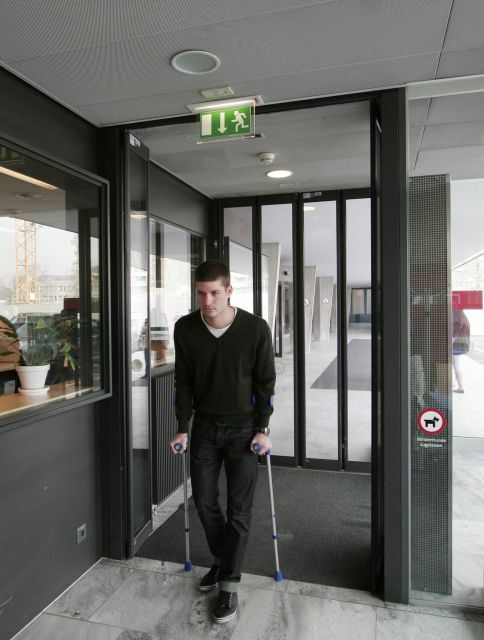 The compact automatic folding door is supplied pre-finished. The door system is supplied completely prefabricated from special profiles. Aluminium profiles which can neither trap nor crush limbs or people and with integrated lip seals ensure a high level of safety and guard against drafts. Barrier-free construction; can be easily fitted with contact-free switches and programmed with longer opening times. Air-lock and porch function; two coordinated door systems control access or prevent the movement of air between the interior and exterior. Building automation; integration into existing building management systems. Electromechanical drive unit built into a self-supporting aluminium header profile, size (h x d): 120 x 250 mm. Mains supply 230 V 50/60 Hz. Adjustable motion parameters, obstacle recognition in both directions of motion. Automatic opening enlargement on detecting people cross traffic in AUTO-RED mode. Aluminium profile which is free of clamping and crushing points (finger protection), with integrated sealing lips. Swivel mounted on maintenance-free roller bearings. 800–1400 mm with a minimum built-in width of 1060–1660 mm. Manual unlocking internal and external. Modes are 'off', 'automatic', 'auto-red', 'output' and 'open'.